No matter how big or small your company, every entrepreneur needs a home office -- a room that is just for your business separate from the rest of the house. While you could go the traditional wood paneling and wainscoting route, there are some who dream wilder. Here are five outrageous, incredible office designs every entrepreneur will want to try. For the Jimmy Buffet-lifestyle entrepreneur. Sure, you may love the beach life, but what if you live in New England and aren’t ready to pack it all in for Malibu just yet? Take a tip from Justin Kemp who wanted to experience sand and workspace combined (his nod to Brian Wilson and his early surf tunes). Being in Massachusetts didn’t stop him from trying. He built his own sandbox home-office workspace. Feel like some sand between your bare toes while watching a snow storm? It’s possible. 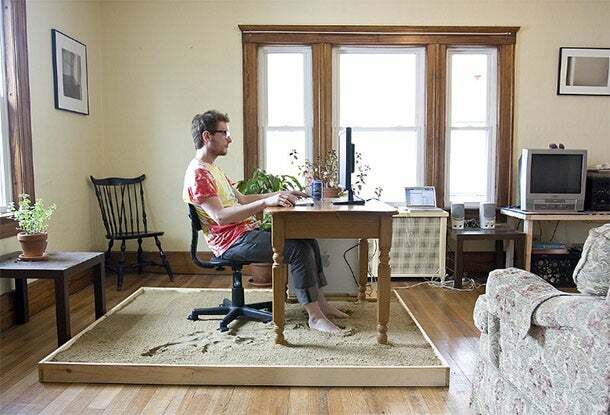 Now you can live and work at the beach, no matter where your home office is located. Love your cat, but tired of listening to his distress calls from the top of your bookshelf when he gets stuck? It might be time to call the Because We Can Design Firm in San Francisco. 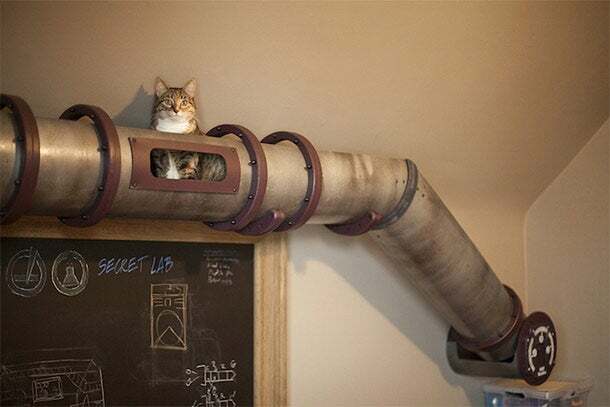 The team there revamped one home office in an incredible “Mad-Scientist” style that even included what they called a “cat-transit system.” For all intents and purposes, it’s an exposed metal pipe that your feline friend can use to access hard-to-reach areas of the home office without assistance. Never worry about how fluffy is going to get down from the bookshelf again. Love books? Trying to store them while still being able to easily access them can be difficult, not to mention the space limitations. 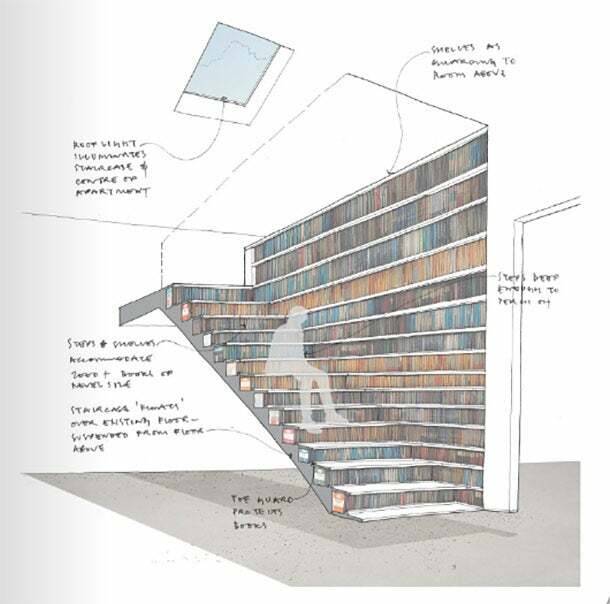 Have you ever thought about making your staircase into a bookshelf? That’s what the literary minds behind UK architectural firm Levitate did. They transformed a small space into a floating staircase that also doubled as a full wall bookshelf. Each step offered a leg up on book organization, as well as an expanded seating area for reading while browsing. There is also room to put your desk under the stairs, as the unit is built to “float” and keep empty space beneath it to maximize every usable area. There are plenty of reasons to be inspired with this work of art that works perfectly. For the outdoorsy entrepreneur stuck inside. One of the great things about being an entrepreneur is you often have a more flexible schedule than the traditional 9-to-5 corporate gig. However, there are often tight deadlines and demanding clients that still manage to keep you inside for more of your day than you may prefer. The solution? Bring the outdoors inside! This isn’t your typical white walls and potted plants set-up. Transform your office space by turning an entire wall into a vertical garden. 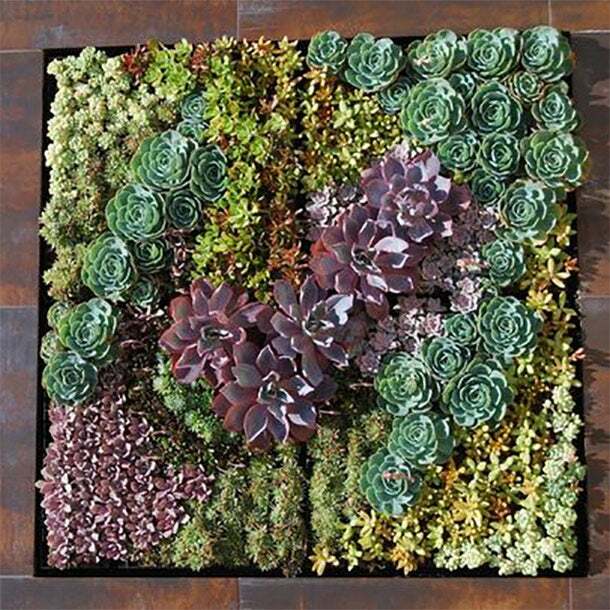 Succulents are a great plant variety to bring your wall to life as they are hardy, don’t need much watering and can look very modern and colorful. You’ll improve your home office's appearance and air quality with a statement wall of vertically-planted succulents. For the entrepreneur with limited interior space. If you like the thought of bringing the outdoors inside, but lack the square footage in your home to plant a vertical wall garden or create a workspace sandbox, what can you do? Take the office outside, naturally. 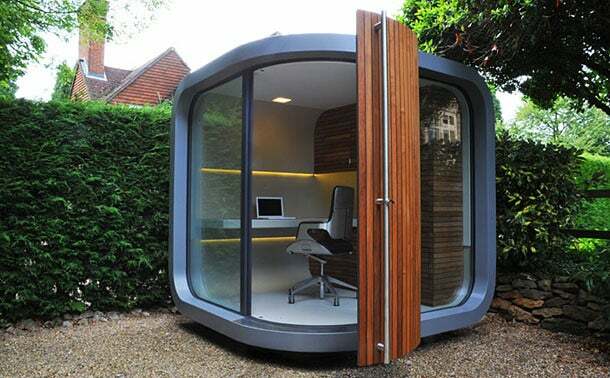 Check out this totally modern, very cool pod for the backyard from design firm Office Pod in the UK. It’s the ideal one-person office space, delivered as one contained modular unit. You can customize it for your own desk set-up, utility hook-ups and all the rest. Your kids don’t have to be the only ones with a fort in the backyard.